It isn't a natural waterfall, but it's pretty nonetheless. 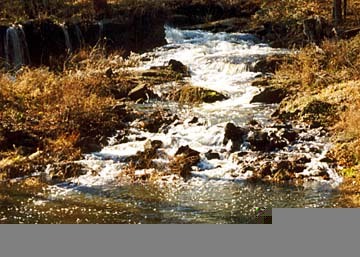 Clouds Creek is dammed up to create Padgetts Pond, but the creek creates a small 5-foot falls after heavy rains. 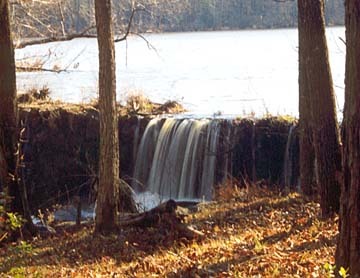 The water freefalls over the dam and flows around edge of the dam over rocks and field stones to create a picturesque scene. Originally, the dam supplied power to a grist mill. The new owners are currently restoring the property, the dam and the mill. Directions: Monetta is in southern Saluda County, South Carolina. From the town of Batesburg-Leesville, drive west on SC 23 for six miles toward Ridge Spring. Look for the signs indicating the town limits of Monetta. Turn right onto Padgett Pond Road and drive seven miles until the pavement ends. Go another half mile, cross a low-lying bridge over a marshy area then cross a one-lane bridge over Clouds Creek. The dam and falls will be on the left as you cross this bridge. All photos © Allen Easler.